If you’ve ever thought about taking up running, but the prospect seems overwhelming, I’ve got some tips for you! First things first – invest in a new pair of running shoes! This really will help your whole body feel it’s best as you begin to challenge it in new ways. If you aren’t already, I’d suggest getting good and comfortable with walking. Start with a 15 minute stroll every single day. Every week increase the time by 5 minutes until you get to at least 30 minutes every day or most days, and longer walks at least 1-2 days per week. It’s an important step to get comfortable with walking, because you want your body to let you know of any issues in your tissues immediately. The biggest reason that people fail in their exercise goals is that they attempt to do too much too soon – either too intense of a workout or too long of a workout. Some muscular discomfort following your workout is acceptable, particularly in the quads and calves if you’re walking or running. The type of pain to be concerned about would be joint pain, acute sharp stabbing type pain, or pain that is primarily on one side of the body. Should any of that occur, please see your Dr immediately. Make sure to find the route that’s right for you! If you think the elements will be a way for you to make excuses, invest in access to a treadmill. Otherwise, decide on going to a track (pros: softer, flat, easy to track distance / cons: repetitive), or mapping out a few routes near your home or office (a shorter route, a longer route, a more challenging route). Note any hills (they’ll seem a lot steeper when you’re not in a car) or areas without sidewalks, etc. Set yourself up for success! Make appointments to walk/run and pen them into your calendar like any other appointment. Make sure you’ve chosen a time of day that won’t make it easy to self-sabotage (not a morning person? Don’t set your alarm an hour early and think you’ll stick with it long term). Lay out or pack up your workout clothes the night before. Create a motivating playlist. Allow yourself a healthy reward afterwards (an extra couple minutes in that hot shower, new workout clothes after a month of success, a pedicure every 2 weeks that you meet your goals). Go ahead, post each outing to social media and ask your friends to help you stay motivated. 3 miles-per-hour or slower, I’d suggest your intervals be what feels like speed walking to you. 3-4 miles-per-hour, try a slow jog for your intervals. 4 miles-per-hour and faster, try a full jog or slow run. There’s some great apps out there that will track your timing every week, like Couch to 5k (a 9 week program to get you ready to jog a 5k – just over 3 miles), both free options and paid, but you don’t need them if you have a watch with easy to ready seconds, or stopwatch. Make sure you start each outing with a good warmup; at least several minutes of walking. Then increase your pace for whatever length of time seems manageable to you – as short as 10 seconds, anywhere up to 1 minute. Then drop back to your slower pace for 1-4 minutes. Keep repeating that cycle for the duration of your walk/run. End with walking to cool-down, and a few minutes of stretches to finish. Maintain that patterning for a week, and then every week increase your faster pace intervals by about 10% while decreasing your slower pace intervals by 10%. 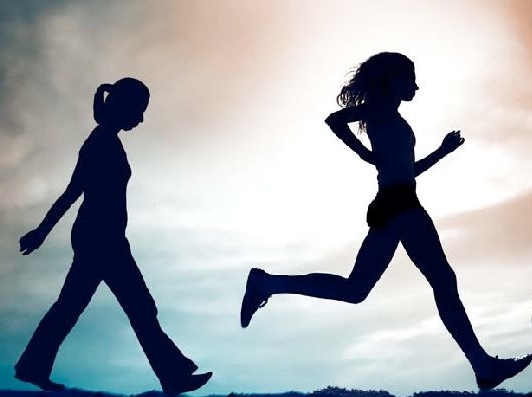 Each additional week add :30 to your Jog time, keep your :30 walk breaks unchanged. You might feel like you can do away with the :30 walk breaks sometime between getting to 5 and 10 minutes of jogging. If you don’t, that’s ok too! Just keep increasing your jog intervals by :30 each week. If this is feeling like it changes too fast, change the increases/decreases to :15 each instead of :30, or change your intervals every other week instead of every week. The most important thing is to stay patient with yourself. Enjoy the progress that you’re making. Practice is about progress after all, not perfection. Fitness is a journey, not a destination. Here’s an interesting tidbit in case you were wondering – mile for mile, running a 10-minute mile will burn about 25% more calories versus walking a 15-minute mile. If you walked or ran for 30 minutes, that would be 2 miles of walking versus 3 miles of running, and running would result in an approximately 50% greater calorie burn during those 30-minutes. Depending on the intensity of your walk/run, you might burn different fuel though. It’s also worth noting that your body will want more calories to compensate for the additional expenditure, so if your goal if weight loss, please partner these workouts with a solid meal plan.